On December 3, 2015, the LISA Pathfinder mission blasted into space carrying the most stable spacecraft thruster system ever qualified for use in space. Developed by NASA JPL, the Space Technology 7 (ST-7) Disturbance Reduction System (DRS) is designed to control the spacecraft's position to within a millionth of a millimeter. 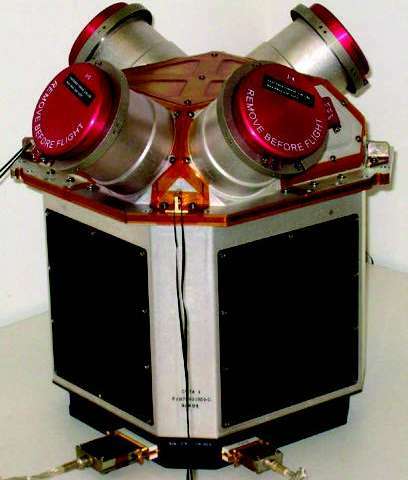 ST-7 DRS consists of clusters of colloid micronewton thrusters and control software residing on a dedicated computer. To operate, the thrusters apply an electric charge to small droplets of liquid and accelerate them through an electric field. This new thruster technology has never successfully been used in space before. ST-7 DRS will deliver extremely small pulses of energy (5 to 30 micronewtons of thrust) to precisely control the LISA Pathfinder spacecraft. Precise spacecraft control is vital to achieve the LISA Pathfinder goal: demonstrating technology concepts required to detect low-frequency gravitational waves. Gravitational waves are incredibly faint. The magnitude of oscillation is on the order of tens of picometers—one picometer is one trillionth of a meter—which is why it is critical to keep the spacecraft stable enough to detect the waves. The LISA Pathfinder contains two test masses— objects designed to respond only to gravity (to the greatest extent possible). These test masses are made of a mixture of gold and platinum so that they will be very dense, but also non-magnetic. They each weigh about 4 pounds (2 kilograms) and measure 1.8 inches (4.6 centimeters) on each side. The LISA Pathfinder spacecraft is intended to shield the test masses from external forces so that they follow a trajectory determined only by the local gravitational field. The dominant force to overcome is solar pressure, which pushes on the spacecraft and is the equivalent of about the weight of a grain of sand. By precisely measuring the position of the freely floating test masses, the ST-7 DRS uses its "micro-rocket" thrusters to keep the spacecraft centered about the test masses. In effect, the spacecraft essentially flies in formation with the test masses, using onboard sensor information (provided by the European LISA Technology Package) to control the thrusters and keep the test masses totally isolated from external forces. By measuring their relative motion, a future mission could use such test masses as references in the quest to detect gravity waves. ST-7 DRS is one of two thruster systems being tested on the LISA Pathfinder mission (the other system was developed by the European Space Agency). If successful, there are numerous potential uses for this technology in the future. For example, the system could be used to stabilize a future spacecraft that needs to be very still to detect exoplanets. ST-7 DRS could replace the reaction wheels that help control a spacecraft's orientation, reducing the overall mass of the spacecraft. The thruster system could also be used to enable spacecraft to fly in formation. For example, a constellation of small satellites flying together could use these thrusters to remain highly synchronized. When it comes down, someone will want to know where it lands because that gold-platinum sphere will be worth some serious money. I am assuming that people are losing confidence in the Ligo "discovery", and that what is being interpreted as evidence of gravitational waves caused by two black holes colliding was probably the result of the earth cracking, caused by fracking going on in the next state. Ligo would detect that. The logic that, if gravity waves exist then we should be able to detect them 100% of the time, is difficult to dispute. Two detectors miles apart got it at the same time. people are losing confidence in the Ligo "discovery", and that what is being interpreted as evidence of gravitational waves caused by two black holes colliding was probably the result of the earth cracking, caused by fracking going on in the next state. Ligo would detect that. The logic that, if gravity waves exist then we should be able to detect them 100% of the time, is difficult to dispute. Bzzzzzt. Thanks for playing though; we have some lovely parting gifts for you!